Denial is a very common word in the world of drugs and addiction. Most often, this word takes meaning when we have a family or friend who won’t admit that they have a problem and go to a drug and alcohol treatment center. But what happens when your seemingly quiet neighborhood is turned upside down by a tragic heroin overdose and death? You might hear your neighbors say things like, “I had no idea!”, and there is a lot of shock among everyone. And like ants, where there is one, there are more. Someone gave him the drugs. And you might start to wonder who else you might know is using heroin and if there are dealers in your neighborhood. How Can I Tell If Heroin is a Problem Where I Live? If there is a dealer in the area, cars will be stopping at all times of the day and night. You will see people stop for only a few minutes and leave. They get in, grab their drugs and leave. You may notice that their porch light is on, even during the day. This means they are open for business. You will also notice many of their customers bringing in personal property, such as TV’s or bicycles into the house to exchange them for drugs and leave without them. You may also see a person just standing on the street corner with no apparent purpose. These people are called lookouts and are there to watch for police. In an ideal world, we hope that people will seek out drug and alcohol treatment. Instead, addicts will do whatever it takes to feed their addiction, and often times, this includes breaking into some of the local residences or cars to steal anything of value. Jewelry, cash, it doesn’t matter. If it can be traded for heroin, it will be stolen. 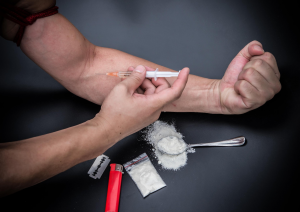 Many drug and alcohol treatment centers consider heroin among the most powerful mainstream drugs. Another way to smell out heroin is to observe your surroundings in public places. Many recovering addicts in drug and alcohol treatment report parks as being the number one place for drug dealings outside a private residence. Parking lots are also very popular. Signs of dealings and drug use may again include cars stopping briefly or driving slowly, short interactions and the exchange of packages. You might also see paraphernalia at or near the location, such as discarded baggies, tinfoil, balloons, needles, spoons, and more. Even more surprising; drug and alcohol rehabs can also be targeted! Residents in a drug and alcohol treatment do not typically have cars and are prime targets for dealers who boldly show up right near the facility! Heroin addicts generally disregard their appearance and look unkempt and ragged. Many times, users who are desperate for their next fix, will use immediately right in their cars. Look for people passed out in their cars in any of these areas you may suspect. While awake, heroin addicts appear sleepy and out of it. Pay attention to their demeanor also. While not high, addicts can become very aggressive. You may also notice the appearance of paranoia or being unfriendly and overly secretive. Some people think that heroin and other drugs only permeate poor neighborhoods. This couldn’t be further from the truth. People of all backgrounds use heroin and it can penetrate into rich areas just as easily. Drugs cause death, increased crime and public fear, abuse and neglect of children, and heavy burdens on public social systems. Just about everyone is affected. If you suspect any drug activity, call your local police. You may just save a life by getting someone into a drug and alcohol rehab program. His and Her Houses offers industry leading Heroin Addiction Treatment Programs. We were founded in 1994 and we base our Drug Addiction Treatment programs on five key principles: commitment, honesty, integrity, respect, and service. These five principles guide us in all that we do and all the care we provide. Contact us today to see how we can help you or your loved one at (888) 376-7268.